WhatsApp stickers have been driving me crazy ever since they were released a month ago and judging by the number of apps that have been popping in the iOS and Play Stores it’s clear a lot of people are loving the stickers features just as much as I am. If you want to take your sticker game to the next level though, I would advise you to download Sticker Studio and start creating your own Stickers. The application allows you to draw an outline around your pictures and then you can save these in sticker packs and put them on WhatsApp. The saving and creation of the stickers is pretty easy and the app will give you clear instructions on how to do so. Each pack must have at least 3 packs before it can be uploaded to WhatsApp. When creating sticker packs make sure you are in the right folder. If you’re creating them from the home page of the app then they’ll be put in a separate pack. Once you have created one sticker and named the pack for it you can then proceed to click on that pack and create all the stickers that belong in that pack within that pack. The zoom options could be improved because as it is, you’re going to be making some stickers with some weird edges, especially if you’re just using your fingers. 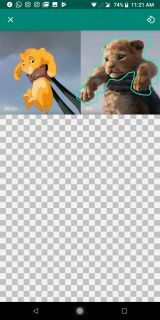 If they improve the zooming tool then you’ll probably be able to refine those edges and your stickers will come out looking much much better. The app has a limitation of 10 sticker packs with a maximum of 30 stickers per pack which is a bit strange since there’s no paid version removing these limits. It’s unclear whether the limit is there because the developers want to monetize the app in future but if that’s not the case then it would be pointless to have the limit.